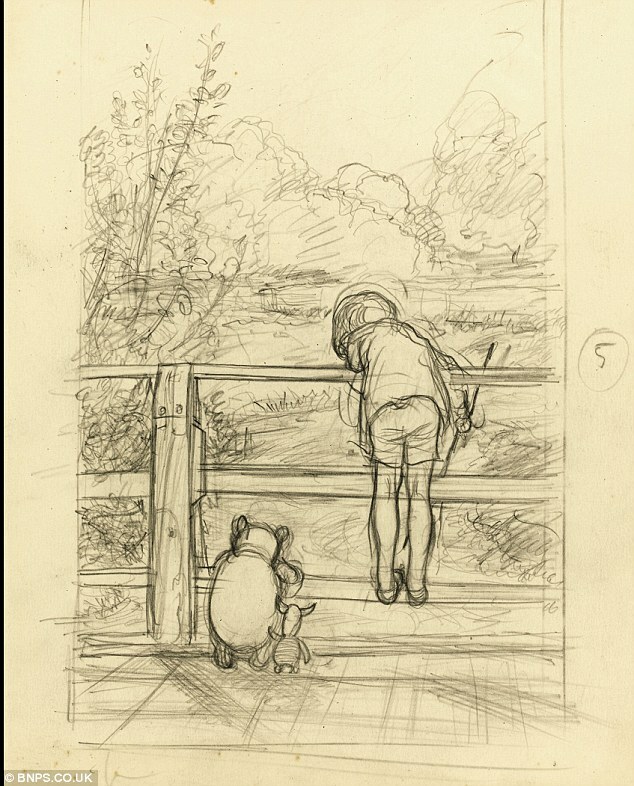 When I was in college I became obsessed with Winnie The Pooh created by A.A. Milne. Ernest H. Shepherd’s early drawings of the characters ignited my imagination first, and then I started to read Mr. Milne’s works from the 1920’s and I was permanently charmed. Those stuffed animals-come-to-life, and their master, Christopher Robin, became a very important part of the core memories of my collegiate days. Pooh sticks on the bridge, adventures in the 100 Acre Wood, Eeyore bringing his gloom and doom, the boundless energy of Tigger, the devotion of Piget, the grumpy and worrisome Rabbit, and of course the lovable Pooh Bear with his insatiable appetite for honey. I’m sure everyone has a favorite character, one they identify with the most. I identified with Piglet with his love for his best friend Pooh and his small size, but mighty will. But oddly, my favorite was Eeyore. I was just rooting for him. And that pink bow tied to his tail was a little flag of hope. If you’ve read even one of my blog posts, you know I come from a genuinely happy place. It’s not forced and it’s not contrived. After seeing Inside Out, I can easily identify that Joy is primarily running the show in the headquarters of my brain. She may not always be the one pushing the buttons as I act and react, but she’s the guiding force of my emotions. And Joy can’t do her job without letting Sadness, Disgust, Fear, and Anger take the wheel. All of our emotions work together. I think and write about contrast all the time and the movie reinforced for me the value of that. To benefit from the light, we need the dark; our happiness is tempered with unhappiness, success with failure and on and on. If you’ve seen it, let me know what you thought of Inside Out in the comments! If you want to dive even further into the world that Pixar created for this film, read THIS! Something else that has had me thinking is a powerful play I saw here in New York City a few weeks ago. At The Table was written and directed by my friend Michael Perlman and if you live in NYC and are a human being, it is a MUST SEE! It is so provocative, on the pulse, and one of the best contemporary pieces of theatre I have seen. When I made plans to see the show, I didn’t know anything about it except that my friend is a successful emerging playwright, and a very celebrated director. The play reminded me of a conversation that I’d recently had with a new friend. We talked about how everyone has something to bring to the table. We may not like it, agree with them, or may not even understand their point of view, but as humans we all deserve a seat at the table and an opportunity to make our offering. Michael’s play gives voice to many points of view, tapping into race, sexuality, feminism, and privilege — everyone eventually gets a say. The play is running at HERE Arts Center until July 19th, I would love for all the New Yorkers reading this to see this very important piece of work. I’d like to see it again, let me know if you’d like to join me! Here is ticket information. This is Lisa's from that evening, a stunning and delicious bowl of food! I think I had seconds and thirds! 1 generous handful of chopped cilantro which I completely forgot but is a must have! Add onion, beans, tomatoes, raw corn kernels, and jalapeño and the mixed dressing to the bowl and gently combine. Before serving, toss the avocado in the lime juice, folding it into the mixture. Lisa served hers with boiled eggs and radish on the side which were delicious additions! This is mine, not nearly as pretty as the one above, but super tasty!